I’m one of those people who loves to group pieces in a collection all together rather than go the mix it up route. I guess that’s because I’m a symmetrical kinda gal. I find balance very relaxing to the eye, even when there’s a lot of stuff to look at. 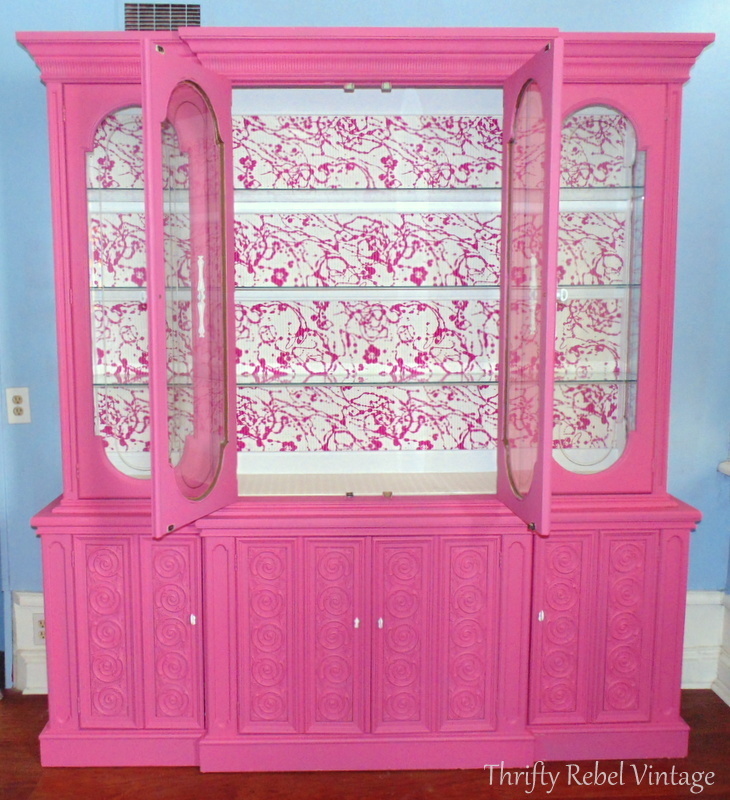 When I did my hot pink china cabinet makeover I thought I was going to store some etsy shop inventory in it, but I quickly changed my mind because I just loved it too much to use it for that. I have to say that it was quite the job figuring out just how to organize it to my liking, but after an afternoon of playing I’m happy with the way it turned out. There were a couple of issues that I needed to deal with before I could start filling my newly painted china cabinet. The first issue is the wooden frame around the doors makes things sit pretty low in the bottom area. To fix this I decided to raise it up so items could be seen better when the doors are closed, which will be most of the time. To do this I added some random pieces of 2″ x 2″ lumber as a base. Then I added some pieces of cardboard boxes onto of the wood pieces. 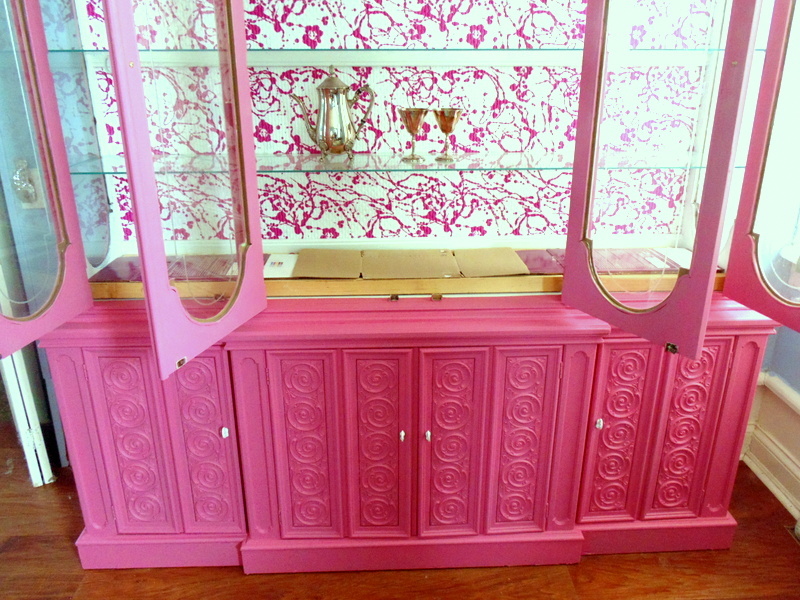 And on top of that I placed some slide proof vinyl shelf liner, and I painted the fronts of the wood pieces pink. 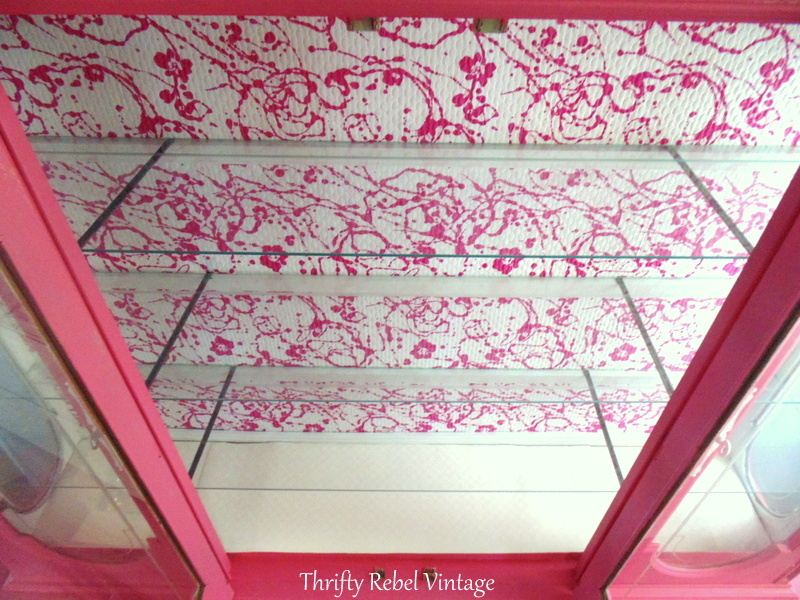 The second issue is that these glass shelves are old, probably from the 60s to 70s. To me it’s amazing that they’re all still in tact and in great shape, but I don’t entirely trust their strength. I cut some steel pieces with a hack saw, which will give extra support to the shelves… and small buttons will help to prop up the shelves where needed so they’re level. Just on the inside of the middle door frames are small metal supports for the glass to sit on. The steel piece sits on that and on the wooden support at the back. Then I used the small buttons to prop up the glass shelves on the supports at each end. This was done purely as a precaution, just to make me feel better. 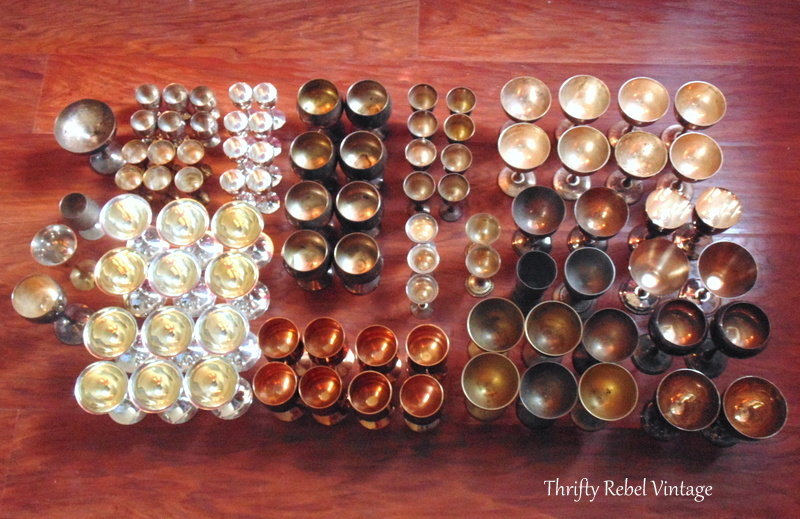 Hers’s most of my silver treasures. 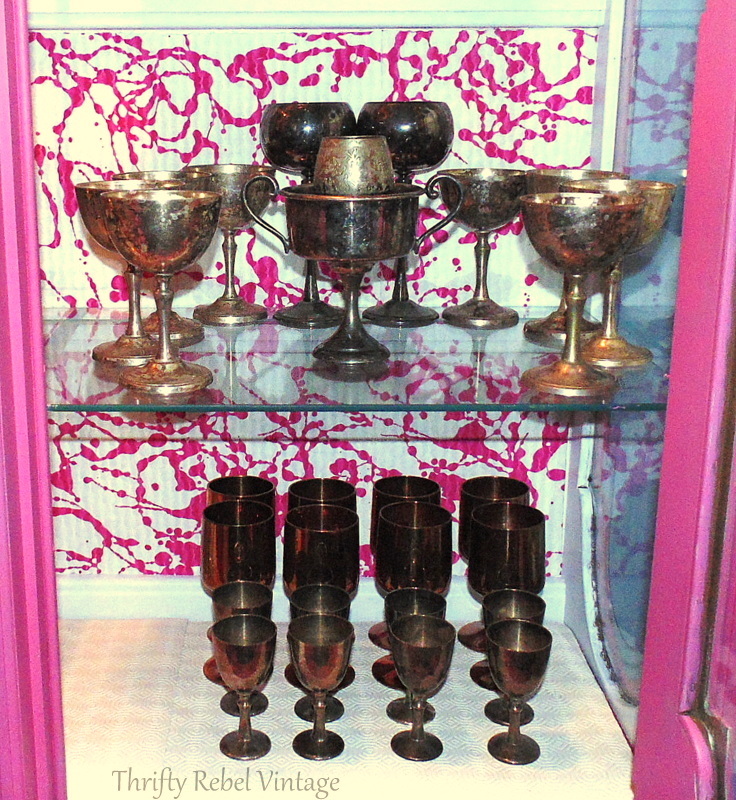 I organized my goblet collection in sets and was amazed that I had so many… 91 in total. Who the heck needs this many goblets? lol. This is what happens when you buy things with the intent of using them for something and you hide them away, and then you buy more. In my defense they’re so cheap around here. Some sets were just a couple of bucks. I’m sure all of these goblets combined cost me less than $50. I still plan on repurposing some of them, but until then they’ll look nice on display. Some of these teapots sets will be used for wind chimes, and some will probably be sold at some point and replaced later by others. And some will be kept… like the genie looking set in the top left. I found that set for $7 and I’ve never seen another one like it. Unfortunately the markings are very hard to make out. Unless some day I find out that this set can greatly increase my retirement fund, it’s a keeper. The antique egg cup set that I shared here is also a keeper. It’s missing the spoons, but that’s just fine. The vintage gravy boat will be enjoyed, and then probably sold after a while. I bought it because it was interesting, but I’m not really loving the dragon or scary bird head handle. Either way, it’s not really my thing. 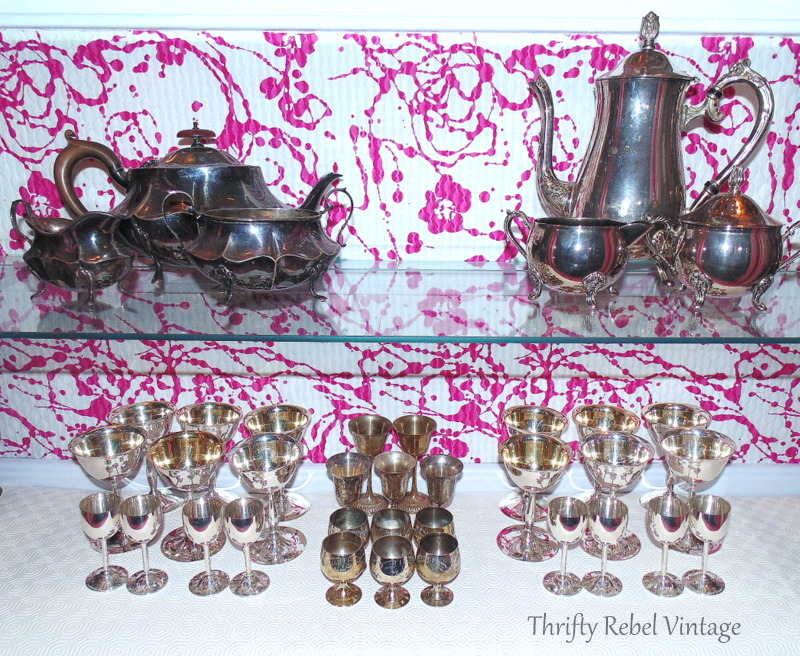 The two pewter goblets on the right have lovely raised relief designs. The silver basket vase is a nice balance to the height of the egg cup holder at the other end of the top shelf, and this solo teapot will definitely become a wind chime some day. 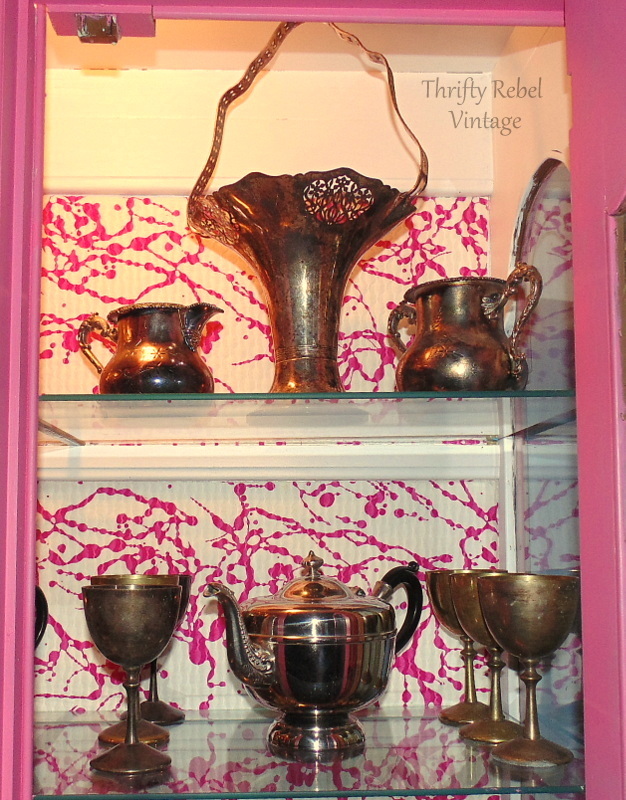 Here a vintage small loving cup is the central attraction, surrounded by goblets. 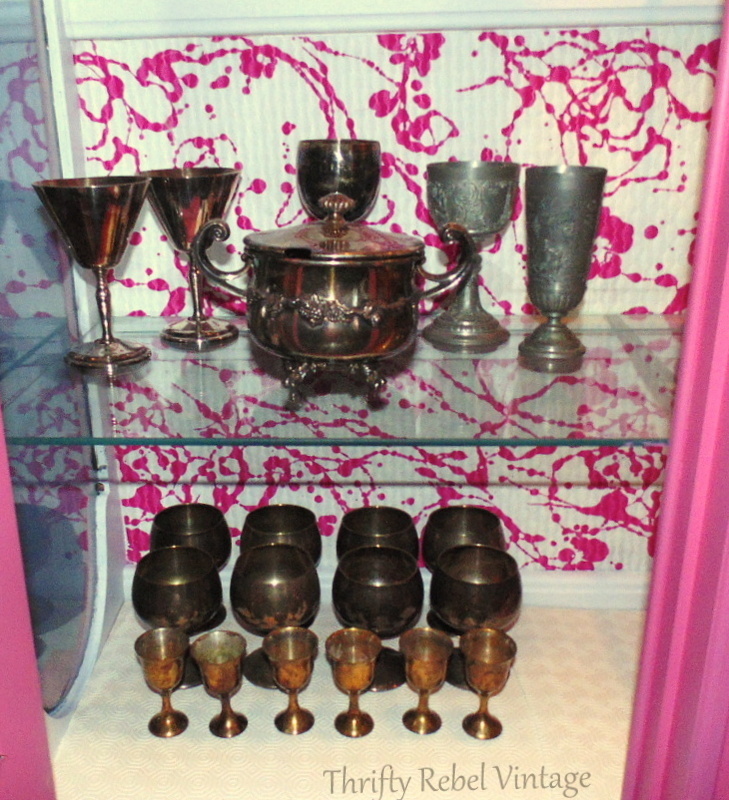 And finally… the end of my goblets… the back set is copper here, and the front set if silver. This is the best photo I could get with the doors closed and it’s terrible. lol. I took so many pictures trying to get just the right one, but the living room is on the north west corner of the house and has low light and the windows are in all the wrong places for using natural light properly. Ahhh… much better. It’s easy to see how much I love balance. This picture was taken at night with no window glare. The lights inside the cabinet really make the silver sparkle. 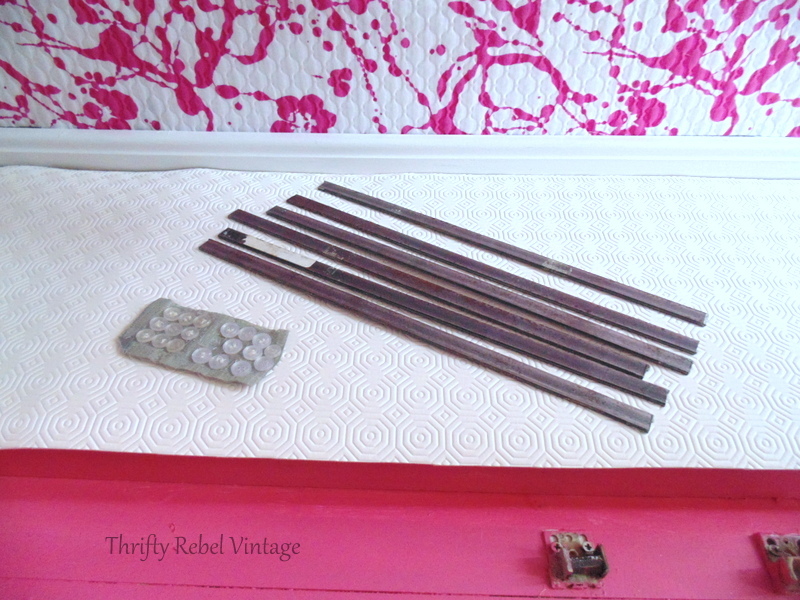 Can you believe all these things were crammed into my tiny 8′ x 11′ craft studio? I can’t!!! No wonder it was so crowded. More of my collections are coming out of there too, into some future projects for my kitchen. My craft studio might almost be empty some day. lol. Thank you so much! It’s so nice to have all my silver treasures out where I can see them. I’m finally able to enjoy them. Thanks Dona! I always feel better when I get something organized. How wonderful that you have your mom’s crystal. I’m sure it sparkles in your glass cabinet. Thanks so much Colleen! To me organization is beautiful thing. I can’t help to think how sparkling everything would be if you used silver polish. But why bother. Beauty is in the eye of the beholder. I think if looks grand. Love the pink!! Thanks very much Janie! You’re so right about beauty. I’m a patina loving girl and rarely polish silver of any kind. To me it’s so interesting to see how different sets, and even pieces within sets, age in their own way. A craft studio that’s empty– never going to happen!! I love the balance too and your new cabinet really showcases all of your great pieces. Great fun! Thanks AnnMarie! I have to say that it makes me smile every time I walk into the living room. Sooo Beautiful…I am in awe; ( and maybe just a tiny bit green with envy LOL) ! 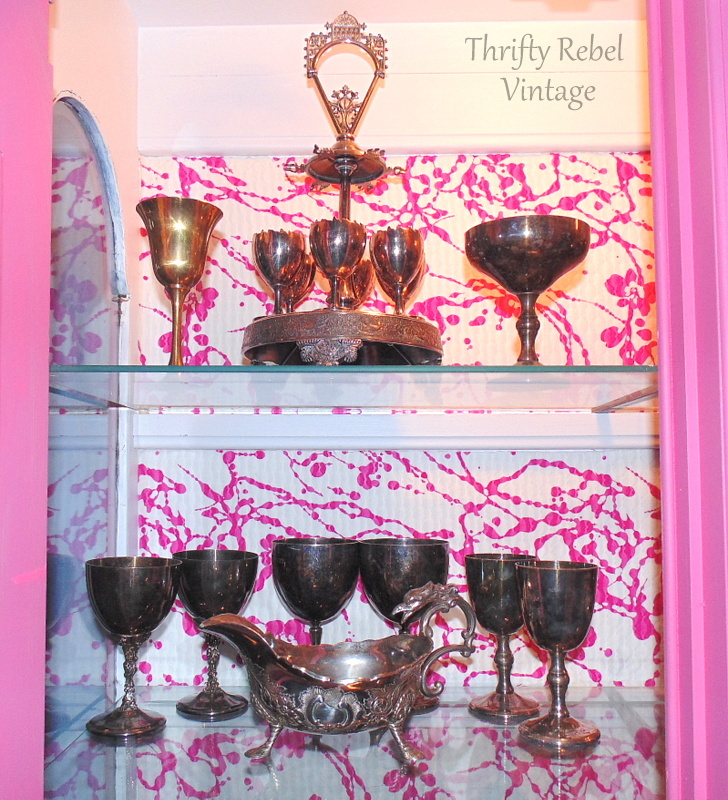 I am in love with the hot pink cabinet – so lovely filled with the silver collection. I am surprised there’s not just a tad of green or aqua in there. Thanks Donna! I really didn’t want any distractions from the pink and silver. I just love the combo too much! 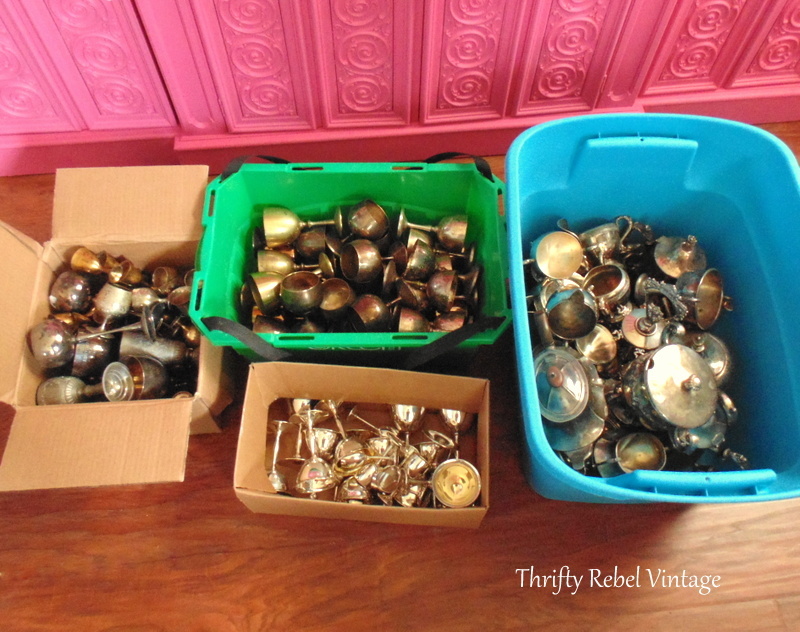 And to think I fave so much silver to the thrift store! Looks so nice. Wow, that’s a lot of silver Tuula! 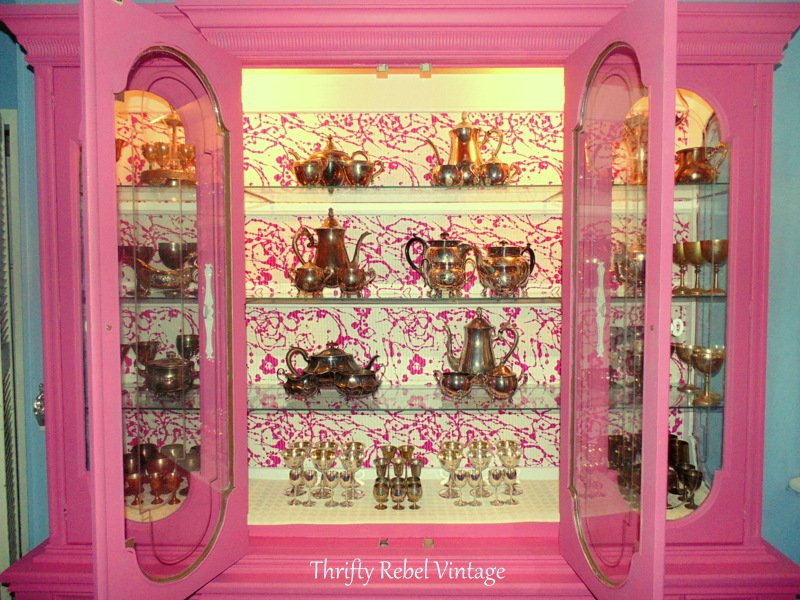 Love it displayed in your gorgeous pink cabinet! Thank you for sharing @Vintage Charm! 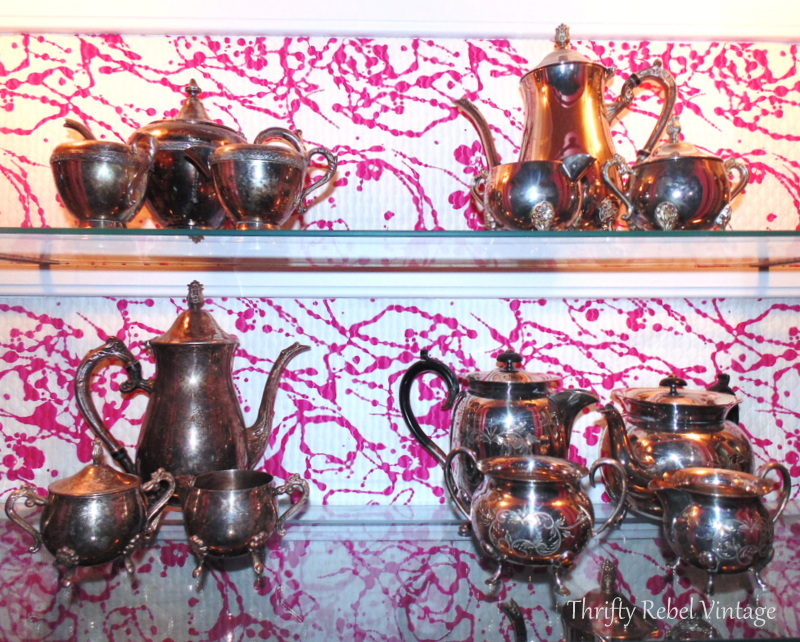 Wow, that’s some silver collection, and it really looks good in your cabinet. You have some nice pieces there, even that dragon thing! I kind of liked it. You must have made a heap of room in your craft space now. Thanks Florence! My craft studio is definitely feeling more spacious these days. I have a few more collections to take out of it and arrange in the house to give me even more creative space, plus it’ll be nice to actually see my collections. 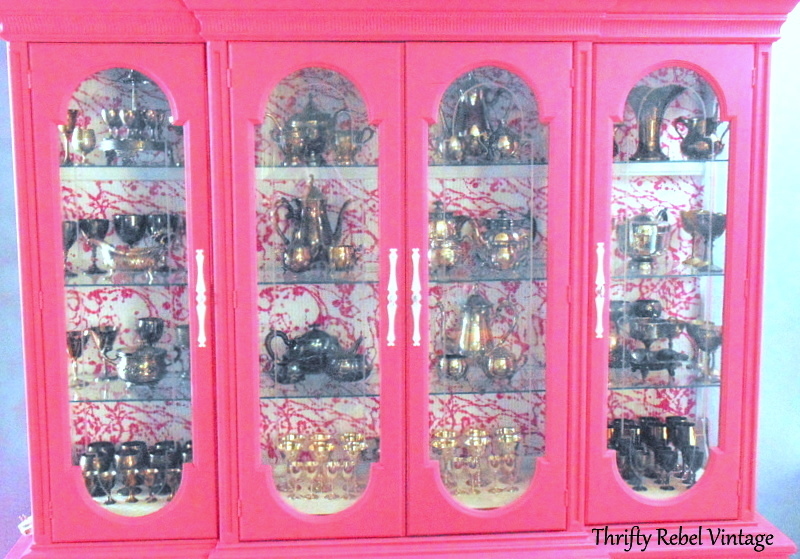 Your hot pink cabinet is absolutely beautiful inside and out – I love the way you have your treasures arranged! You go girl! What a unique and beautiful collection! You have some interesting pieces. 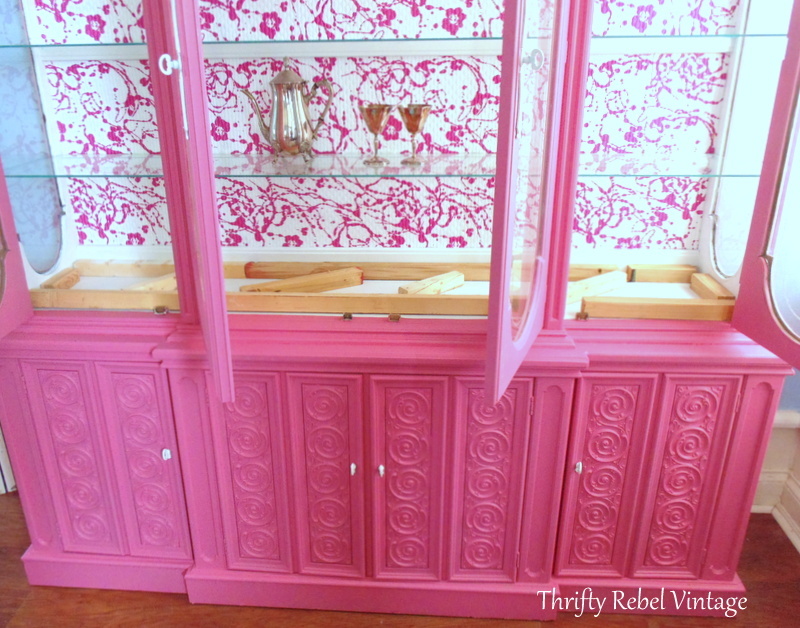 Your pink cabinet looks fab! Thanks very much Jill! I’ve always loved the combo of pink and silver. WOW! a lot of silver. Looks great grouped like that. I have several pieces I’m going to mosaic. lol…don’t hate me or anything. Most are a bit damaged. And they need some help.